Cut each roll in half, lengthwise and place bottom halves on the bottom of a baking pan. Layer bottom half with ham slices and cheese and place the top half back on. In a bowl, Mix together the butter, Worcestershire, mustard, brown sugar and onion powder. 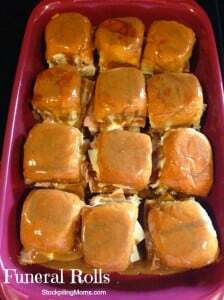 Pour sauce over sandwiches, drenching each one. Cover tightly and marinade anywhere from 4-24 hours. Overnight works best! Bake for 15 minutes uncovered,or until cheese is melted and bun tops are a bit golden.